London: G. G. J. and J. Robinson, No. 25, Pater-noster Row. The frontispiece shows a man in Greco-Roman dress offering a bound volume to two women, one in Grecian drapery and one probably representing Athena or the goddess of wisdom with her helmet and spear. This issue contains "Sprigs for working a Gown, Cloak, or Apron." This issue contains a "new Pattern for a Work-Bag, or Fire-Screen, &c." and an essay "On Female Beauty and Ornaments" from Curiosities of Literature. The essay discusses "odd" foreign notions of beauty. This issue contained "A new pattern for working a Handkerchief or Apron." The issue included "Account of the Ladies' Dresses on his Majesty's Birth-Day" on pages 302-8. These are all court dresses. ACCOUNT of the Ladies' Dresses on his MAJESTY'S BIRTH-DAY. [from page 307] Lady Templetown. Rich white satin guaze, with point fringe. 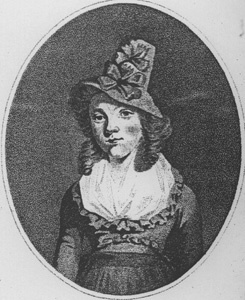 Viscountess Sydney. The petticoat blue gauze, trimmed with silver tissue, with an elegant embroidery of silver, the body and train the same, trimmed with silver. This issue contains "A beautiful Portrait of the Princess Sophia."